Dr Oz and his staff should have done more research before recommending palm oil. In doing so, he has inadvertently declared war on orangutans-- along with every other living creature in the jungles of Borneo and Sumatra. The Malaysian and Indonesian palm oil industries have hired high-end lobbyists in Washington DC to gain influence in the US congress and hoodwink the American people into thinking palm oil is 'good' for them. Like all lobbyists these people have an agenda-- and they are NOT telling the complete story. While originally from West Africa, today 90% of the global supply of palm oil actually comes from Indonesia & Malaysia. This has come at a tremendous environmental cost. Indonesian and Malaysian forests are being burned to the ground-- releasing so much carbon into the atmosphere that Indonesia now ranks 3rd behind China and US in carbon emissions-- and it is barely industrialized. The UNEP estimates that the forests of Indonesia are being cleared at a rate of 6 football fields per minute every minute of every day. 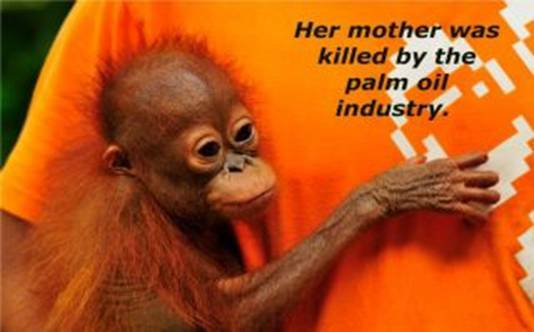 The palm oil industry is guilty of truly heinous ecological atrocities, including the systematic genocide of orangutans. The forests of Borneo and Sumatra are the only place where these gentle, intelligent creatures live, and the cultivation of palm oil has directly led to the brutal deaths of thousands of individuals as the industry has expanded into previously undisturbed areas of rainforest. When the forest is cleared in order to make room for oil palm plantations, every living creature is captured or killed. Adult orangutans are shot on sight. These peaceful, sentient beings are beaten, burned, mutilated, tortured and often eaten. Babies are torn off their dying mothers so they can be sold on the black market as illegal pets to wealthy families who see them as status symbols of their own power and prestige. This has been documented time and again. If nothing is done to protect orangutans, they will be extinct in just a few years. The orangutans need YOUR voice! Please leave a comment on Dr. Oz's website and Facebook page.